Mayoral candidate Lori Lightfoot, J.D. ’89, discussed her policy platform at the IOP on Tuesday. She was interviewed by IOP Pritzker Fellow Laura Washington through ChiElect, which has invited all mayoral candidates to speak at the IOP about their ambitions for Chicago’s future. 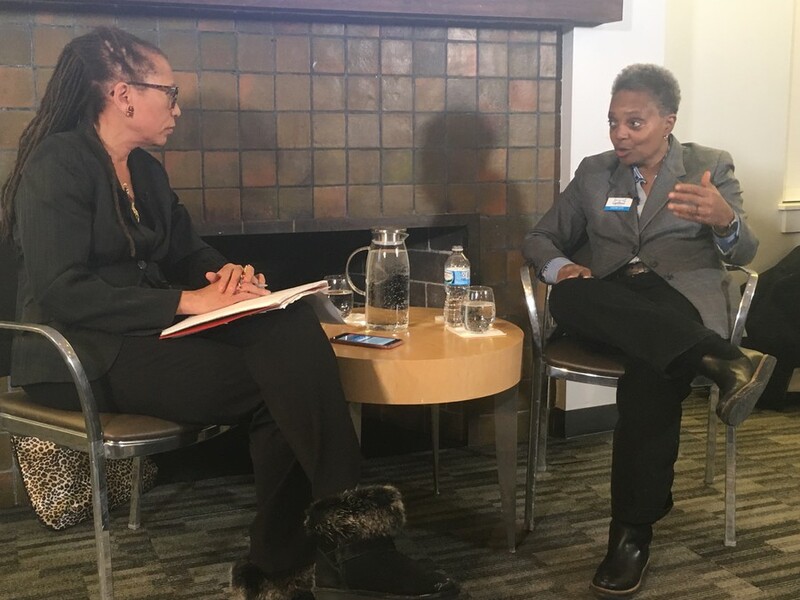 Lightfoot spoke about her sexual orientation, as well as her stances on term limits, the Jason Van Dyke trial, city revenue, and affordable housing. Lightfoot has held several government positions, including assistant United States attorney, president of the Chicago Police Board, and chair of the Police Accountability Task Force. As the first openly LGBTQ+ candidate to run for mayor in Chicago, Lightfoot hopes to show young people that they have the ability to be themselves and lead an authentic life. “The fact that I am able to run openly, as a married person with a child, really says something remarkable about where we are in the history of our city,” she said, “We are not as welcoming and inclusive as we need to be, but the fact that I can do this without repercussions or consequences or death threats is important.” Lightfoot also said she believes her sexuality allows her to bring a different lens to the challenges and struggles of the Chicago community. Lightfoot supports implementing a two-term limit for the mayor. “We've had people who have stayed in office for way too long and you run out of ideas, you run out of innovation,” Lightfoot said. She said that aldermen should have term limits as well, particularly limits on how long one can serve as the chairman of a committee. Lightfoot predicted that about a third of the city council will turn over in the upcoming elections. Commenting on the sentencing of Jason Van Dyke, Lightfoot said she was disappointed but not surprised. Van Dyke, the former Chicago police officer who shot Laquan McDonald in 2014, was sentenced to six years and nine months in prison. Lightfoot said that very few police officers are charged with misconduct committed while on duty, and voiced concerns about the conduct of the judge in Van Dyke’s case. “The judge failed to disclose she had a prior relationship with one of the defense attorneys,” Lightfoot said. “The fact that she didn't disclose that was really problematic and was a red flag about the direction she may be heading. Jason Van Dyke getting frankly less time than most people spend in pre-trial detention is an outrage.” As head of the Police Accountability Task Force during the Van Dyke investigation, Lightfoot made headlines for her criticism of Mayor Rahm Emanuel. Lightfoot argued that low- and middle-income families are being crushed by the tax burden. “We have been treating taxpayers like an unlimited ATM machine,” she said. Lightfoot also stressed the importance of building affordable housing in the city. Towards the end of her talk, Lightfoot called on UChicago students to vote. “Imagine the power that you'd have if you showed up and voted in large numbers in aldermanic races,” she said.